Jacob Gerhard Epp, minister/farmer was born on 8 May 1882 in Rosenbach, Fürstenland, Russia, the second child of Gerhard Gerhard and Katharina (Dyck) Epp. Jacob G. Epp served his alternative service at the forestry camp in Neu Berdjansk where he gave his life to the Lord in 1905. On 29 November 1907, Jacob married Elizabeth Paetkau, daughter of Isaak and Susanna (von Niessen) Paetkau, born 6 December 1887 in Rosenbach, Fürstenland. In 1909, Jacob Epp was baptized, joining the Fürstenland Mennonite Brethren Church. He soon became known for his zeal in preaching and Bible study. He was ordained as a Mennonite Brethren minister in 1913 by Gerhard Regehr. In spite of official restrictions, Jacob witnessed to his Russian neighbors, for which he imprisoned in 1920. Undaunted, he conducted Bible studies with the guards. Jacob was released after one week; his influence on the guards was a threat to prison officials. Owing to the severe famine in 1921, the Epp family decided to leave Russia for Canada. When their passports finally arrived in September 1926, they left the next day for Moscow. On 20 October 1926 the Epps landed in London, England. Soon after they boarded the ship SS Melita, arriving in Quebec City, Quebec on 29 October 1926. The family briefly settled in Langham, Saskatchewan and then moved to Waldheim. They were in the process of buying 320 acres near Glenbush, Saskatchewan when Jacob Epp read an advertisement for good farmland at $135 per acre in Yarrow, British Columbia. The Epp family soon left for their new homeland with nine children, the eldest being 19, and the youngest under 2. The Jacob Epps together with eight other families arrived in Yarrow on 21 February 1928. As an ordained leader, Jacob Epp was among the handful of people who helped set the course for the community. He was also elected to the "Schultebot", the community disciplinary committee, because he carried out his duties in a fair and loving way. The Epp home became a place where young people met on Sunday afternoons for Bible study and singing. Jacob G. Epp was the first preacher to serve the young Yarrow Mennonite Church which initially was made up of both Mennonite Brethren and United Mennonite members. Jacob brought with him the fervor for Bible Study and preaching he had practiced in Russia. Initially he invited neighbors to Sunday worship at his home. On Good Friday, April 1928, Jacob Epp led the congregation in the first official worship service in Yarrow. He was diligent in the preparation of his sermons, concerned to nurture his listeners. Among the sources he used in preparation were the writings of Josephus, Charles Spurgeon and Johann Heinrich Jung (Jung Stilling), authors he had brought with him to Canada. He was appreciated for his warmth and caring expression by all the early settlers in Yarrow. 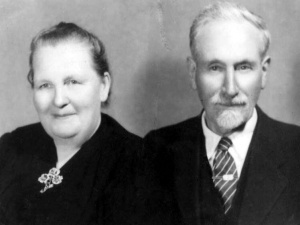 Jacob and Elizabeth Epp became charter members of Yarrow Mennonite Brethren Church in 1929. As a minister, he also became a member of the Church Council (Vorberat). Jacob Epp continued a long a fruitful preaching ministry, taught a men's Sunday school class, officiated at weddings and funerals, baptized new Church members and visited the sick and shut-ins, a practice he continued until the week before he died. He was a man of prayer, regularly attending and often leading the Saturday evening prayer meetings in the church. The Epps often hosted other local ministers and their wives or out-of-town guests in their home for a time of fellowship and encouragement on Sunday afternoons. Their guest room was seldom vacant. Jacob Gerhard Epp passed away on 1 March 1949. Elizabeth (Paetkau) Epp passed away on 2 May 1949, just two months after her husband's passing. Both are buried in the Yarrow cemetery. "Br. J. G. Epp," Zionsbote (23 March 1949): 12. Dahl, Tina Epp, "Epp Family Tree." Unpublished, 1976. "Pred. Jakob Epp," Mennonitische Rundschau 15 (13 April 1949): 1. Harder, Esther Epp. "Epp, Jacob Gerhard (1882-1949)." Global Anabaptist Mennonite Encyclopedia Online. February 2003. Web. 19 Apr 2019. http://gameo.org/index.php?title=Epp,_Jacob_Gerhard_(1882-1949)&oldid=143056. Harder, Esther Epp. (February 2003). Epp, Jacob Gerhard (1882-1949). Global Anabaptist Mennonite Encyclopedia Online. Retrieved 19 April 2019, from http://gameo.org/index.php?title=Epp,_Jacob_Gerhard_(1882-1949)&oldid=143056. This page was last modified on 8 January 2017, at 20:26.